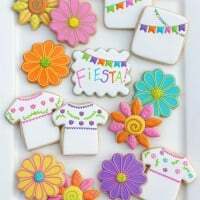 I’ve made a LOT of baby shower cookies over the years, but it’s always fun to play with new designs or different color schemes. 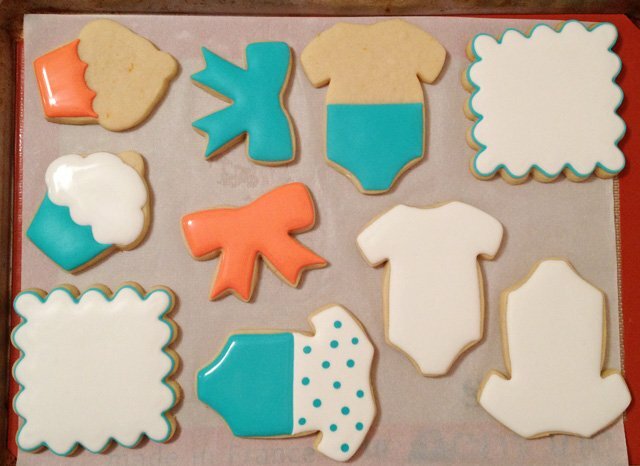 These Modern Baby Cookies were designed for a sweet blogging friend, Jamie of My Baking Addiction. Jamie is due any day with her first baby, a sweet little girl! 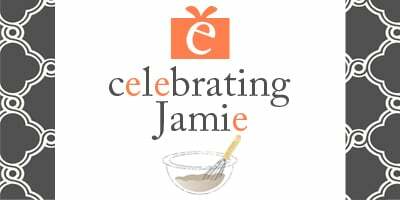 Each of the “virtual” shower guest (listed at the end of the post) were asked to make a baked good, in honor of all of the amazing baking projects Jamie shares on her blog. 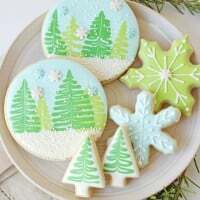 I got the inside scoop on the colors Jamie is using for the baby’s room and had fun decorating this set of cookies with white, gray, aqua, coral and yellow. This was such a fun color scheme and would actually work perfectly for a boy or girl! I kept many of the designs simple and modern, but added a few “girly” touches by added bows and plenty of sanding sugar. A batch of Sugar Cookies (I added a 1 tsp. of fresh orange zest and 1/2 tsp. almond extract in addition to the base recipe). A batch of Royal Icing (color notes below). Cookie Cutters – I used a baby onesie, bow, small cupcake, scalloped square. For the bows – I outlined and then immediately flooded the full cookie, then allowed it to dry completely (overnight). Once dry, I outlined the cookie with piping consistency, as well as added icing where the knot of the bow would be. Once outlined, immediately sprinkle with white sanding sugar. Use a clean, dry paintbrush to brush off any excess sugar. 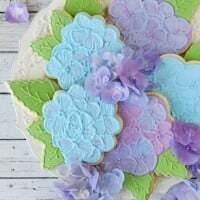 For the scalloped squares (centerpiece cookies)-I outlined the cookies in aqua blue, let that set up a bit (30 minutes or more), then flooded the cookie in white. Allow the white icing to dry completely (4+ hours or overnight). Once the cookie was dry I added the lines of color (using a PME 1.5 tip). Allow the lines to dry (at least 30 minutes) then I added the dots a few at a time, with none touching. Allow these details to dry (1+ hour), then I added grey dots and immediately sprinkled the area with white sanding sugar. For the initial (E) I piped the letter, then immediately covered with white sanding sugar. For each cookie that has two colors side by side (the onesies and cupcakes) I flooded one area, then let it set up a bit before adding the adjoining color. Adorable!! Such a beautiful design! Glory, these are so precious! And I happen to know that receiving them in the mail made Jamie a little teary. You’re such a sweet friend. Thank you for celebrating Jamie and Baby E! So adorable Glory and just perfect for Jamie! Just gorgeous! Those colours really pop. These are absolutely gorgeous! I love the color scheme and the modern design! 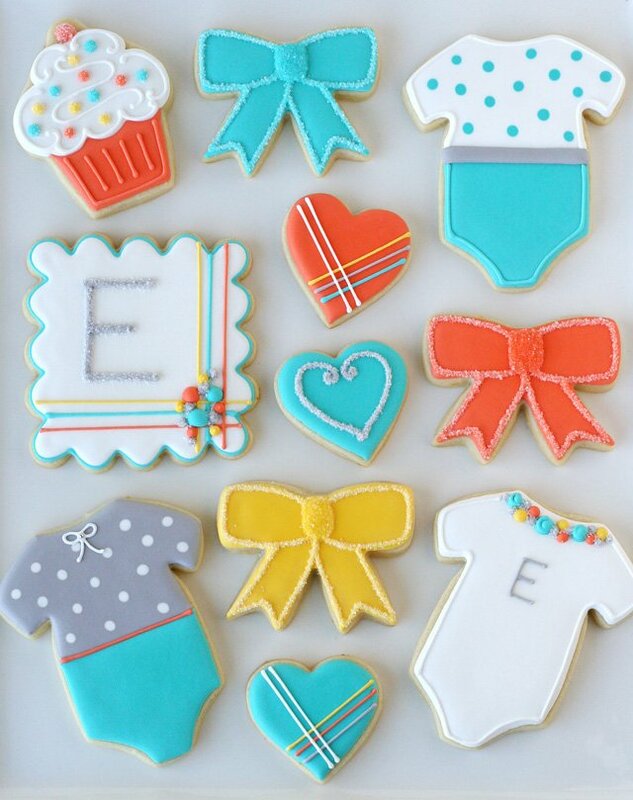 I think these are the most adorable baby shower cookies I have ever seen! They are so sweet!! <3! Very sweet, very colourful and very creative designs! Aww – the onesies are so adorable! very stylish! I still decorate snowflakes. I can’t even begin to tell you how much I love these cookies! The dainty little dots and modern colors? So perfect!! These are the cutest cookies ever! You are crazy talented! These are beautiful! I can’t believe how straight all your lines are… seriously how did you do that!!! Crazy skills! 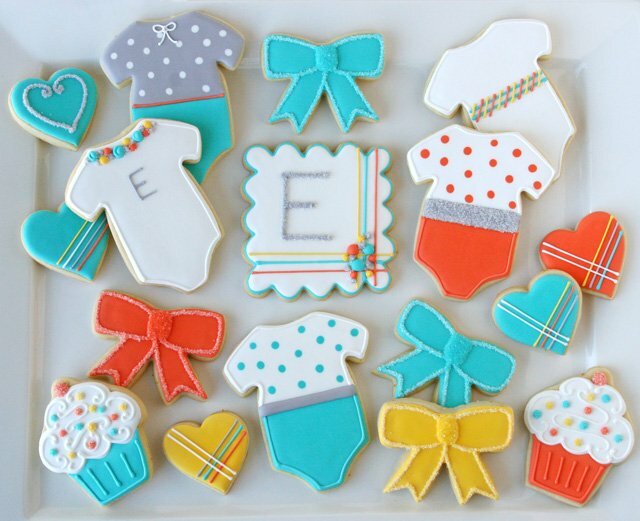 Oh my goodness I can’t wait for someone to have a baby just to make a set of these adorable cookies! Love’em! I love seeing a batch of baby girl cookies that aren’t just pink. These are gorgeous! 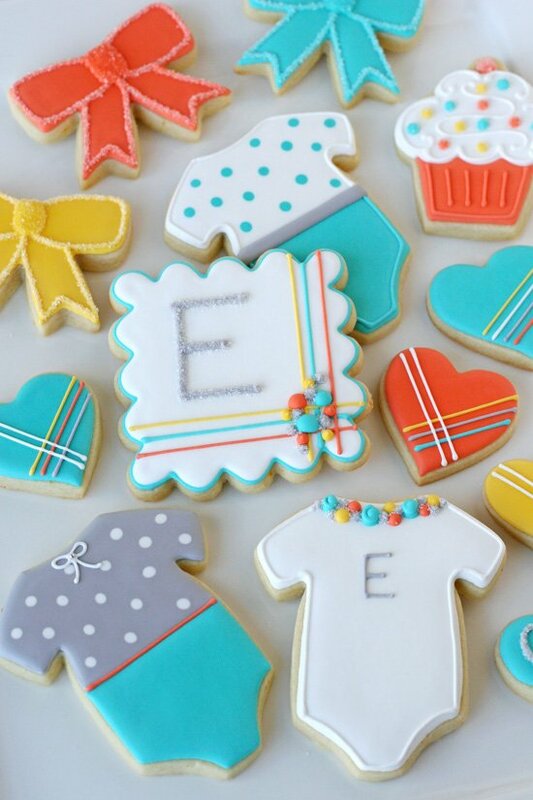 These cookies are too cute, loving the bright colors! The cookies turned out just gorgeous, and the initial with the scalloped edges is the perfect way to tie them all together. These are absolute adorable! Can’t wait to use for inspiration on an upcoming project! These are absolutely gorgeous, Glory! I can’t even begin to tell you how much I LOVE every single cookie. And not to mention, they taste as good as they look! Thank you so much for helping to welcome Baby E to this world. 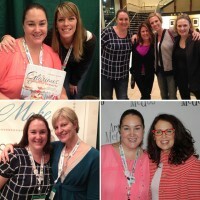 You gals made my week! So adorable! Thanks for posting your sugar cookie recipe – everyone loved the cookies! Super pretty! Love the Colors!